People – not companies or foundations – make over 70% of donations to nonprofits across the United States every year. As we begin to discover if someone might be interested in supporting our cause, we need to start with the fundamentals. Who are they? What is important to them? What (other) organizations do they give to? What are their individual motivations to be so generous? What are the best resources to find biographical information? We all like them to be free, of course, but sometimes free resources can be like a slippery slope with no handholds. Trusting their solidity can be tough. So to give you the best advice for free biographical sites, I looked to my favorites and polled my great team. 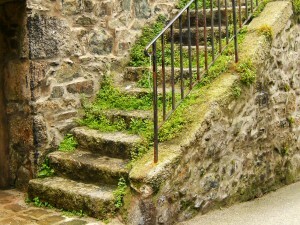 No longer a slippery slope…maybe more like a moss-covered stairway! Born Rich, for the very wealthy (but not only those born into wealth). Great information here about lifestyle indicators, such as homes, boats, art collections, etc. Bloomberg BusinessWeek. In “Stock quotes” on the right-hand side of the page, search for the company where the individual is affiliated (don’t worry, it’s not limited to public companies). When you’ve got your company, select the People tab and click on the name you’re interested in. Company website. Always do a search on the website of the company/ies where the individual is affiliated. Frequently you will find a biography or public relations announcement that may have biographical information. Debretts. For research on people in the UK, Debretts People of Today is a solid resource. There is a fee-based version, but a lot is available for free on the site. Forbes. Always a popular choice for biographical information on top company executives. Especially if they’re one of the top 400! LinkedIn. Information about individuals from the person who knows them best. LittleSis. A searchable (but also downloadable) databank with biographies and connections of the wealthy and powerful. Panache Prive, for people in the tri-state area of NY, NJ and CT. Just search on last name in the search box. Pipl – a free search engine just for biographical information. Pipl aggregates lots of information about people with similar names and works to parse out individuals in the databank. Useful information, but take it with a grain of salt. ZoomInfo. Like Pipl, ZoomInfo aggregates lots of information about people with similar names and works to parse out individuals in the databank. Useful information but take it with a grain of salt, ZoomInfo can be a good source of potential biographical leads. Have a library card? Many public libraries give free online access to lots of resources, including magazines, newspapers and lots more, including Biography In Context, the New York Times Personal Name Index, and Who’s Who. What free resources do you use to do biographical research? Don’t be shy – go ahead and share! Special thanks to Frances Sakanai for suggesting this topic.